Do you want to be a secret Santa? Here are the 7 best gadgets to gift your dear ones this Christmas. Nowadays women safety is questionable - the big cities and metropolitan areas also became unsafe for women to live-in.To tackle the situation, a device inspired by the military has hit the market. The Siren song is a small keychain device makes a blowing audible punch.When the Siren song is activated, it releases a 130 decimal alarm.The device also comes with the LED light. The objective of the siren song is to deter attackers or to call nearby help when you are in danger or trouble.The manufacturers of Siren Song explain, the device "Keep women and children safe at all time".It also keeps away from yelling for help when you met with heart-attack or other health problems.Also, the alarm can be heard from a distance. This device can be attached to keychain, backpack, or purse.And attackers cannot realize it as the personal self-defense device.So, flew to the market to get one for you and gift one to your dear ones. What does your current water bottle do for you - hold water? Maybe you found one that has a few LEDs to make it into a lantern, as well. Meet the Hydra smart bottle " The Ultimate Smart Bottle " design for fun and safety that comes with a premium 5W Bluetooth speaker, hands-free speakerphone, FM radio, 4000 mAh power bank, RGB LED lights with three color modes, hidden storage, a carabiner with bottle opener, and a free app.This can be a really helpful product that serves while traveling. Looking for a Christmas gift? Here is the one that is creating a trend right now. The Smart Back Pack " A Backpack with a Brain ". Whether you travel as a student or a busy work commuter, this backpack is for you. Unlike other bags, it not only carries all your stuff, it's also a charging station with its own internal tracker.Apart from this, they're water resistant, include anti-theft features and are intelligently padded to protect your device. So, what are you waiting for, get one now for your loved ones to protect their loving gadgets? Snap SmartCam is a camera which passes all the requirements of a great spy camera and more. It’s covert and hard to detect, a trait which can no longer be said for models such as a pen, glasses, and USB cameras. They have become so popular that they are always the items you would suspect are being used to record. This is where Snap SmartCam has the advantage because it looks like a simple phone wall adapter that people won’t pay attention to it. Snap SmartCam produces high-quality video and audio with no need of concealment. It’s equipped with a Micro SD with an 8 Gigabytes of storage space. And the smartest thing about this device is that it has motion sensors which determine when it starts and stops recording. You don’t have to sacrifice footage quality to get days’ worth of important information. Compile more evidence for a case or corroborate witness accounts. Be more secure with Snap SmartCam. Worried about the tracking the calories burnt? Or Are you worried about missing your diet plan this eve? Or worried about missing important calls when you forget your phone at home in this busy schedule of celebrating the eve? Don’t worry, smartwatches will do the work for you while you are busy celebrating your eve. Smartwatches come with the features where you can track the number steps you walk so that you can keep track on your calories. You can receive your calls. These watches come with the GPS trackers for navigation on busy roads. It has an alarm, reminders to keep you on the check. The thin and sleek body adds a statement to your style this eve. So why wait? Treat yourself with smartwatch this eve. No wonder everyone has a keychain to hook all the keys in a bunch. But have you ever thought of having smart keychain which is of hustle free? Here is a keysmart to keep all the jingles calm. Here is the KeySmart which organizes your keys at a place. It is a must-have tool for all that practical thinkers. It is such a great tool which can hold up to 14 keys at a place.The key holder is made of 3mm thick plates of aircraft grade aluminum which makes it light in weight. You can put attach to your pocket, bag, or belt with the built-in clip. 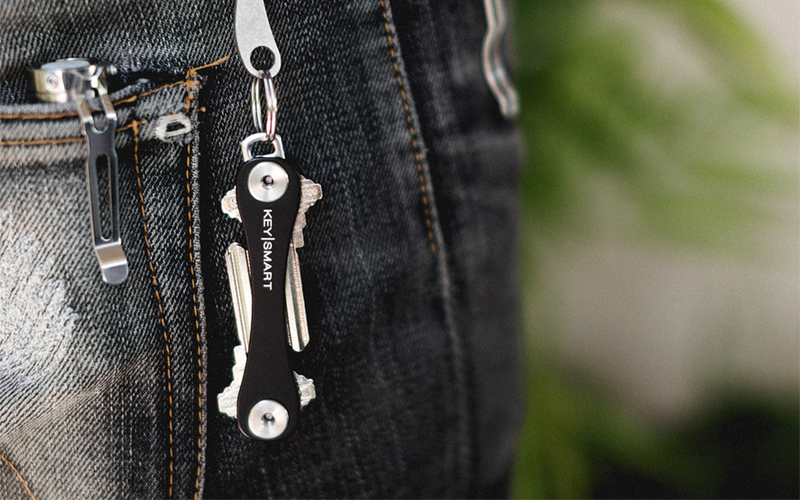 You can also attach USB drive, bottle opener, torch, location tracker to the KeySmart. It comes with the array of colors like - red, black, blue, grey, green, blue, purple, orange or pink. Get a smart holder this eve. The box couldn't have filled with the last and brilliant device.Huddy, the device which transforms Smartphone into a Driving display.Let's take it out of the box and look into why it has taken the internet by storm? The Huddy is a transparent glass which fits any smartphone, no matter what the size is.All you have to do is place your smartphone on the device and leave it.And now it is Huddy turn to look after all navigation. There are tons of GPS apps in the mobile, so it is compatible with all. You can use it in any car.And we can see, it is going to be one of the most purchased apps in coming holidays.